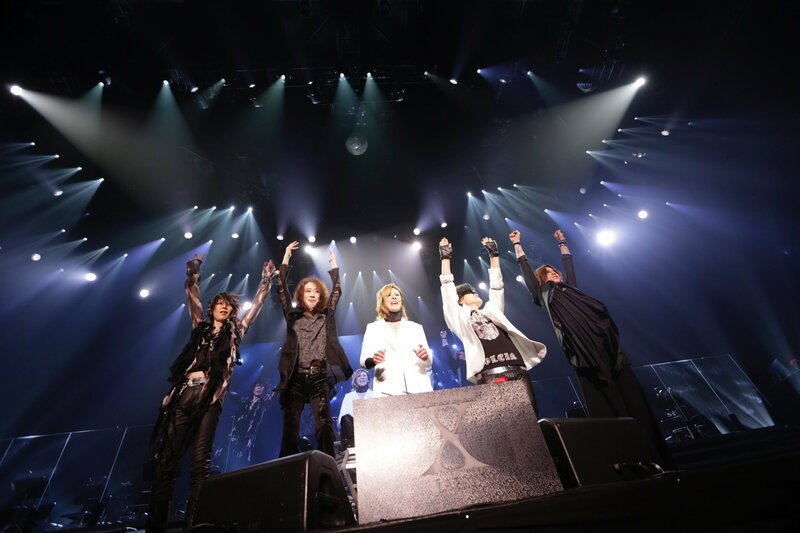 During a press conference held in Tokyo on June 9, X Japan members Toshl, Pata, and HEATH announced that the tour “X JAPAN WORLD TOUR 2017 WE ARE X”, taking place between July 11–17, would convert from a regular tour to an acoustic one. 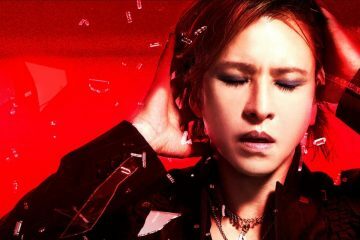 The reason for this mainly comes down to drummer Yoshiki’s health, as doctors instructed Yoshiki to stay away from vigorous exercise for at least six months. 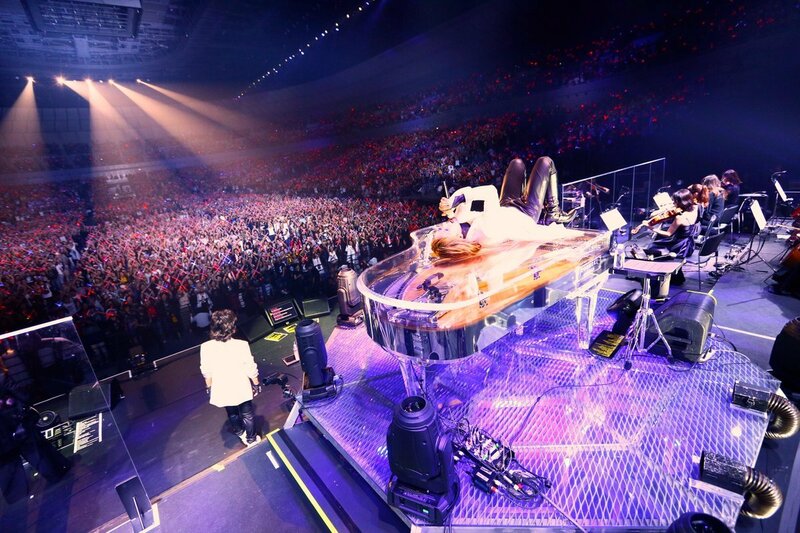 In other words, playing drums was out of the question, resulting in Yoshiki turning his seat to the piano instead. They changed the title of the tour accordingly to “X JAPAN WORLD TOUR 2017 WE ARE X Acoustic Special Miracle 6 DAYS“. 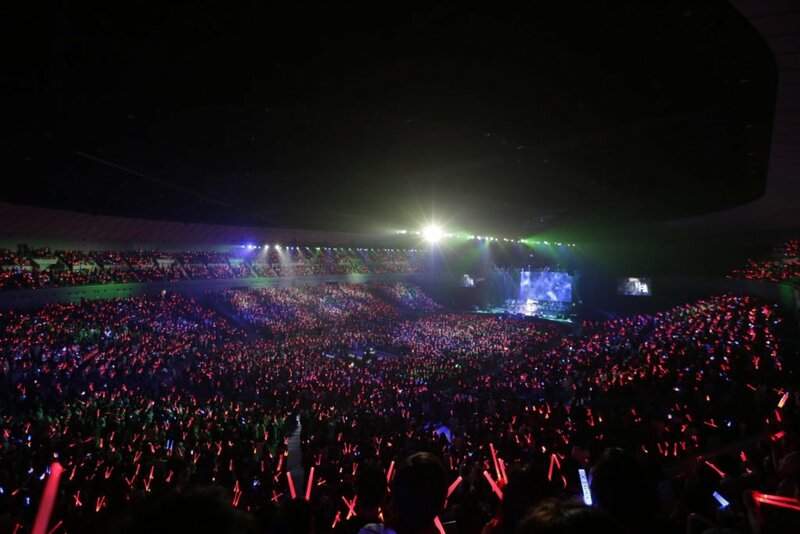 We were lucky to be present on the last day at Yokohama Arena! The closer we came to the venue, the more visible the X Japan fans became. Not only because of the merchandise fans usually wear to concerts, but because many people actually dressed up as the members! It seemed like most of the cosplayers here already knew each other prior to the concert and scheduled for this gathering. They neatly gathered for photos, occasionally yelled “We are… X!”, gaining a lot of positive attention from the non-cosplaying crowd. 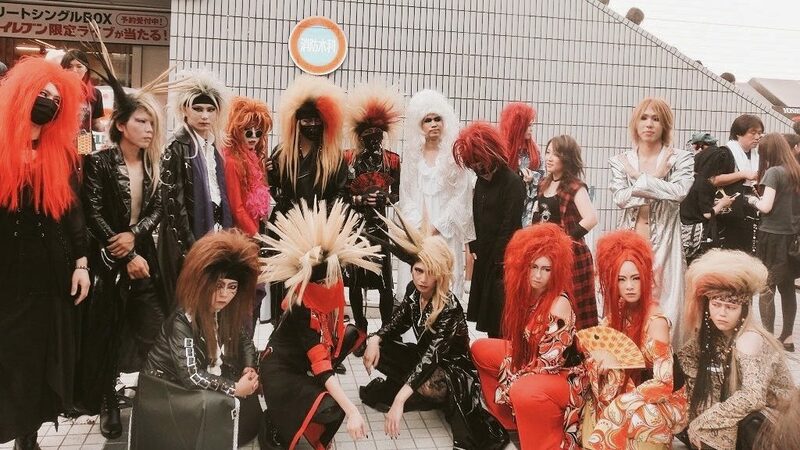 Among these awesome people, former guitarist hide was clearly the most popular to cosplay by both men and women. Some of the cool cosplaying fans. Hide’s popular looks are those with long red hair, as well as those with a combination of red and blond hair. Yoshiki’s early spike hairstyle seemed to be fairly popular too. As Yokohama Arena started to fill with X Japan fans for the fourth day in a row, everyone turned on their red light sticks to form X’s in the air. Scenes of the documentary We Are X were shown on the screens before the lights dimmed, with Yoshiki taking the stage and started playing the song Forever Love, with Toshl, Pata, HEATH, and Sugizo gradually joining. The band was also accompanied by a modest-sized string orchestra. Even after all these days, Toshl’s voice was as strong as always and I instantly got goosebumps. After this first song, the fans started yelling the band member’s names until Yoshiki said “Welcome to a night of miracles”, continuing by claiming that he was surprised that they started the show on time today and that an acoustic live doesn’t mean it’s just going to be a lukewarm show. The whole crowd was waving their glowsticks! The band continued with Tears and Kiss the Sky before it was time for HEATH’s bass solo. As he walked along the side of the stage, one fan managed to hand over her light stick to HEATH who started using it as a pick to play bass. Pata then showed up on stage to steal his moment to shine with his solo instead. Toshl then returned to repeatedly scream “X”, copied by the fans to get ready for a more fast paced song, Drain. While everyone seemed to be really into it, the band suddenly paused the song for Sugizo to perform his violin solo. He finished it with a hand kiss towards the ceiling, probably dedicated to hide. Next was Silent Jealousy, and then Largo. During Largo, Toshl sat down on a chair in-between Pata and Sugizo, playing his acoustic guitar while smiling brightly as the fans took over the lyrics. 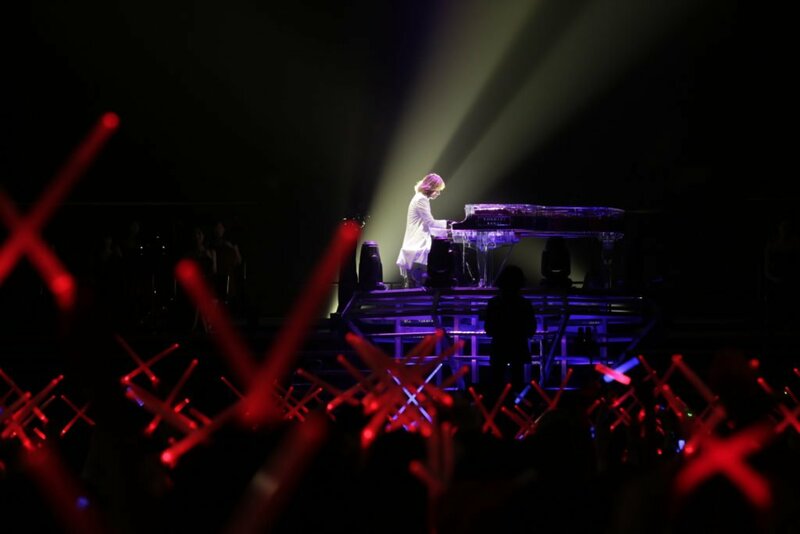 Yoshiki then returned on stage to play his piano solo Swan, accompanied by the string orchestra and then segueing to the song Miracle. Halfway through the song miracle, a young western woman appeared on stage and sang the opera part of the song powerfully. After she finished her long final note, Yoshiki stood up and started thanking her in both Japanese and English. He also mentioned that she can speak five languages and that she’s currently learning Japanese. The woman then took a pen and said, “Kore wa pen desu, Yoshiki wa hen desu” (This is a pen, Yoshiki is strange), everyone started laughing, so she quickly added, “Odaijini” (Get better), to Yoshiki who also thought it was funny. As she left the stage after a big applause, Toshl ran towards Yoshiki from behind, clearly scaring him and everyone laughed again. X Japan continued with La Venus and then Hero. After that, Toshl also sang the chorus of X, making the crowd sing along and jump at “X!”. A bit later, it was time for a short MC which included parts of Voiceless Screaming, hide clips were shown on the screens as the band continued and played Without You. This was another moment where I and many around me became really emotional. During the intro of the next song, we could see hide’s guitar intro of Kurenai (紅) from their last live in 1997, proceeded into playing the whole song. Toshl then announced the last song, Art of Life. Both Kurenai (紅) and Art of Life were more beautiful acoustic than I ever expected them to be. The members left the stage for a while, but everyone patiently waited for the encore. As expected, the band returned to the stage and performed Say Anything as the first song from the encore setlist before Pata took over and played his solo song, Pata’s Nap, it sounded like a cute lullaby. They continued with another favorite of mine, Week End. The version they played included an amazing acoustic solo which made this song feel almost like a passionate Latin song. The members had by now left the stage again. 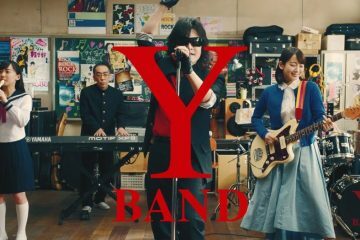 To summon the band members back on stage was the sound of the American voice actor which X Japan has been using since the beginning. The voice yelled their names one by one—including hide and Taiji. When all the members had returned again, Yoshiki seemed to not have much voice left and started whispering in Sugizo’s ear. Sugizo repeated Yoshiki’s words by yelling everything he whispered. Yoshiki laying down on his transparent grand piano. World Anthem played before the members got ready to continue with I.V., which was one of the heaviest songs during this show as Pata and Sugizo used their electric guitars instead of acoustic guitars. Toshl then sang Crucify My Love and Voiceless Screaming only partly, ending it with a loud “Taiji!”. This was the moment where Toshl started to tear up and he couldn’t sing anymore for the next song Longing. The crowd took over the lyrics and kept repeating the chorus while Toshl sat down. He tried to continue several times but wasn’t able to. 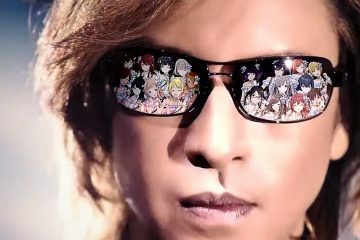 As the song finished, Yoshiki started thanking the orchestra, staff, friends, fans, and the other band members and he too started to become emotional. Last but not least, Endless Rain. For this song a huge disco ball started spinning, filling the arena with beautiful light. After a while, Toshl sat down next to Yoshiki, they both became emotional together at this point. The music stopped and the crowd took over the chorus over and over again. The two of them slowly started to smile, looking up to the fans who kept on repeating the chorus powerfully. Toshl used his last energy to sing the last chorus along with the fans. The fans realized that this wonderful show really had come to an end by now. The members started waving while Forever Love played. They lined up, holding each other’s hands and did an ending last jump. 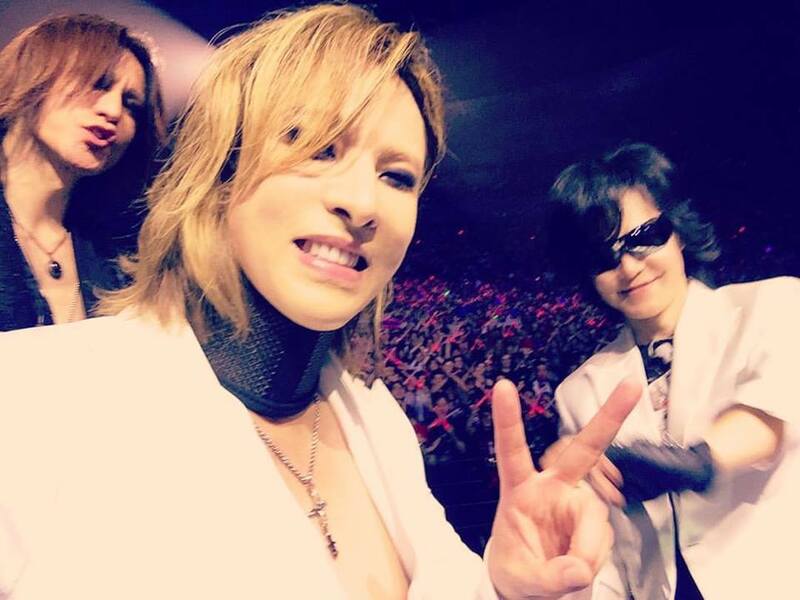 Yoshiki and Sugizo took some selfies before they raised a huge X Japan flag full with written messages by fans. The band members held their hands up high after the jump. As a big X Japan fan myself who didn’t have the opportunity to see them live until this show, I couldn’t be happier. Even though the “heavy songs” weren’t played as heavy as the originals, it was certainly not a boring performance. I’d like to describe it as “powerful emotional”. 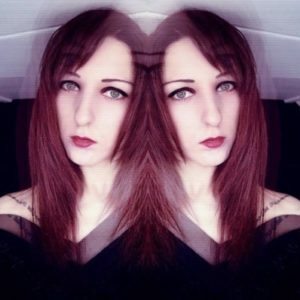 As I also really enjoy classical elements in rock and metal songs. It was very satisfying to see them perform with an orchestra, piano, Sugizo’s violin, and even an opera singer. The atmosphere was very warm to me and it was amazing to see how loving and dedicated their (Japanese) fans were. I hope to be able to see them again someday. Thank you X, and thank you to the people who gave me this opportunity!